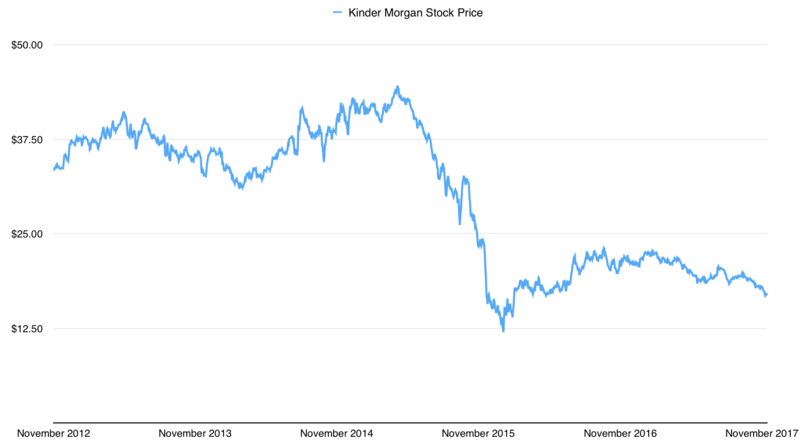 Energy infrastructure giant Kinder Morgan (NYSE: KMI) is one of those tickers that inspires heated debate in the financial media sphere, the overriding source of which stems from its distribution cut during the 2014-2016 oil & natural gas slump. Previously this was a fan favorite of the dividend growth community because it seemingly offered the dual plus of a high starting yield coupled with a relatively high rate of growth. For instance, back in late-2014 the stock was throwing off an annual forward dividend of $1.93 per share against a share price that was in the $40 region. At the time management forecasts still indicated 10% dividend growth out to 2020. Now if you’re a yield starved retiree at the time staring at 10% annual dividend growth on a 4.5%-5% starting yield then Kinder Morgan is going to look mighty attractive. Indeed that growth guidance was maintained well into 2015, even as the outlook was rapidly deteriorating. In reality the downward price action that started earlier in the year probably gave shareholders enough of a warning as to what was coming next. In any case for many investors the damage is already done: these days Kinder Morgan trades at around the $17 mark compared to its 2015 high of approximately $44, and it has become the textbook example of why folks would do well not to chase a dividend without running the numbers first. Recent history aside I’d be wary of any analysis that automatically conflates the performance of the stock price with the underlying business. Indeed I think that the dividend debacle, and ensuing stock price carnage, was more of a valuation issue than anything else. Speaking of the underlying business, it’s worth keeping in mind that this is actually what attracted a lot of folks here in the first place. As the largest energy infrastructure company on the continent Kinder Morgan owns or has an interest in approximately 85,000 miles of pipelines and 150 terminals. In exchange for access to its infrastructure capacity it charges energy companies a fee. Basically it’s a classic toll both model revolving around North American transportation and storage of things like crude oil, natural gas, carbon dioxide and refined products (gasoline, jet fuel, etc). From the conservative investor’s perspective the great thing about that is it makes the company slightly less cyclical relative to other companies in the sector because it massively reduces commodity price risk. Secondly, though a dividend cut can be a hard pill to swallow, particularly for those reliant on the income, it is often a necessary condition to getting the business back on a more stable footing. In other words, not only is it not the end of the world, but it can actually end up being a positive development down the line. Has that turned out to be the case here? Well, on the face of it the numbers look rather better now than they did back in 2015. This year Kinder Morgan will likely bring in around $4.5 billion in what it calls distributable cash flow, or DCF for short (basically annual cash flow less maintenance capital expenditure), while spending $1.2 billion on the cash dividend. All looks pretty healthy at first glance. The primary issue, however, remains the debt load. After all energy infrastructure tends to be a pretty asset intensive business, and over the past twenty years the company has spent north of $55 billion on investment and acquisitions. As it stands the company’s balance sheet is carrying around $37 billion worth of debt net of cash and cash equivalents. Even though that figure is some $5.5-$6 billion less than its 2015 peak, and that Kinder Morgan’s generally stable cash flows can support a more leveraged balanced sheet, 8x DCF still seems a rather lofty figure. In addition, over the next five or so years the company has a backlog of around $12 billion worth of growth capital expenditure commitments. With that in mind it may seem a bit surprising that management is guiding for fairly aggressive future dividend growth going forward. Doubly so given what happened the last time dividend growth expectations were raised. Next year management forecasts a 60% bump to the current annual per-share distribution, taking it to $0.80, with further 25% increases pencilled in for 2019 and 2020 respectively. In other words by 2020 investors could be looking at $1.25 annual dividend and a yield on cost of around 7%-7.5% based on the current stock price. In terms of how all of this will add up on a cash flow basis let’s run though the rough figures. As previously mentioned the company is on track to report DCF of around $4.5 billion in fiscal year 2017, while the current distribution represents something like a $1.2 billion annual cash outflow. Once you include 2017’s growth capex figure (roughly in the $3 billion region) then it appears that Kinder Morgan is currently breaking even on a cashflow basis (give or take a bit). If we then assume that the per-share figure is going to rise to $1.25 by the end of the decade, then the associated cash outflow would rise to around $2.75-$2.80 billion. If you’re wondering why those figures aren’t rising exactly in proportion to one another it’s because the company also plans to spend $2 billion on buying back stock (thus reducing the share count). When you place all of this extra dividend cash alongside future growth capex commitments, plus any meaningful cash flow for debt reduction, there doesn’t appear to be all that much wiggle room. On the flip side this growth capex isn’t being spent for fun: the company has a bunch of new cash flow generating projects that will be hitting completion in the meantime. Take the $5.5 billion Trans Mountain Pipeline Expansion for instance, which is set to more than double the capacity on an existing route connecting producers in Alberta, Canada, with the refineries and terminals in British Columbia. In terms of additional DCF this will net Kinder Morgan somewhere in the region of $650 million in 2020. That’s in addition to a bunch of other growth projects that will also add to DCF going forward. The net result should be a distribution that’s covered by cashflow, though perhaps at the expense of meaningful debt reduction. Clearly it’s an equation with many moving parts (e.g. the impact of interest rates, funding growth via equity, future growth capex budget plans and so on). There’s also fairly sizable political risk to the Trans Mountain Pipeline Expansion project which could throw a spanner in future cashflow assumptions. 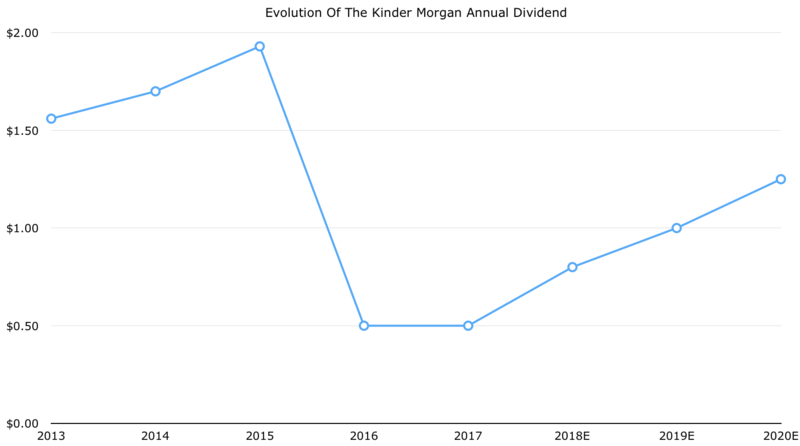 All-in-all I still think there’s a lot to like about Kinder Morgan – chiefly its collection of assets and the toll both business model, but more importantly the stock looks in a far more sensible place going forward than it did a couple of years ago.